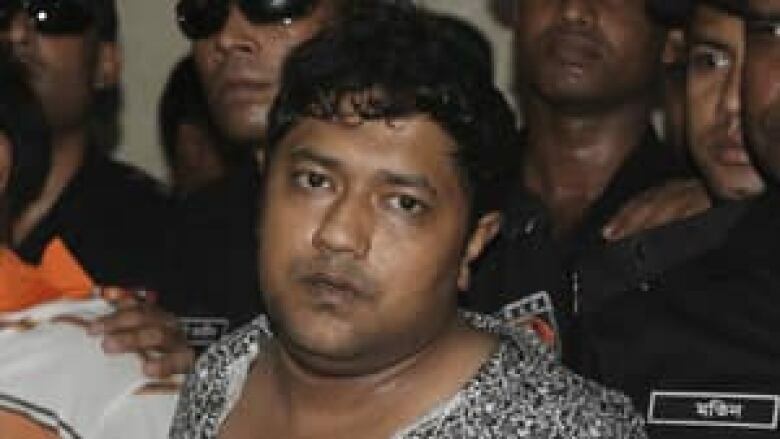 The fugitive owner of an illegally constructed building that collapsed and killed at least 377 people has been captured by a commando force as he tried to flee to India. The fugitive owner of an illegally constructed building that collapsed and killed at least 377 people was captured Sunday by a commando force as he tried to flee to India. At the disaster site, meanwhile, fire broke out in the wreckage and forced authorities to suspend the search for survivors temporarily. Rana's capture was announced by loudspeaker at the disaster site, drawing cheers and applause from those awaiting the outcome of a continuing search and rescue operation for survivors of Wednesday's collapse. The fire that broke out late Sunday night sent smoke pouring from the piles of shattered concrete and halted some of the rescue efforts — including a bid to free a woman who was found trapped in the rubble. An exhausted and dishevelled Rana was brought before reporters briefly at the Dhaka headquarters of the commando team, the Rapid Action Battalion. How can you tell if your shirt was made in a sweatshop? Three floors of the eight-storey building apparently were built illegally. Army Maj.-Gen. Chowdhury Hasan Suhrawardy, the co-ordinator of the rescue operations, said the next phase of the search involved the heavy equipment such as hydraulic cranes that were brought to the disaster site Sunday. Searchers had been manually shifting concrete blocks with the help of light equipment such as pickaxes and shovels, he said. Its garment industry was the third-largest in the world in 2011, after China and Italy, having grown rapidly in the past decade. Among the garment makers in the building were Phantom Apparels, Phantom Tac, Ether Tex, New Wave Style and New Wave Bottoms. Altogether, they produced several million shirts, pants and other garments a year.